EMS-TECH Inc provides world-class solutions while co-operatively working with everyone involved. The company’s specialists are experts in the engineering, design, manufacturing and management of custom-designed bulk material handling equipment and large engineered systems. EMS-TECH’s portfolio includes stackers, stacker-reclaimers, reclaimers, shiploaders, receiving systems, vessel self-unloading systems and transshipment systems. Whether it’s a project that requires full engineering development or mobile equipment design or manufacturer surveillance through commissioning, EMS-TECH is the perfect engineering and management capability source in bulk handling. EMS-TECH offers a maintenance and repair service to give old equipment a new lease on life. Older industrial equipment that appears to be reaching the end of its life may be serviceable, in which case EMS-TECH rejuvenates the equipment, boosting its economic contribution and effectively adding profit to the business’s bottom line. EMS-TECH’s industry-specific expertise lies within its multi-disciplined team of experts in engineering, design, manufacturing, purchasing and management of custom-designed bulk material handling equipment and industrial systems. The strength of the company resides in competence, integrity and its depth of customer relationships worldwide. EMS-TECH’s primary objectives are to complete projects on time and within budget, and to continually meet clients’ goals and objectives. 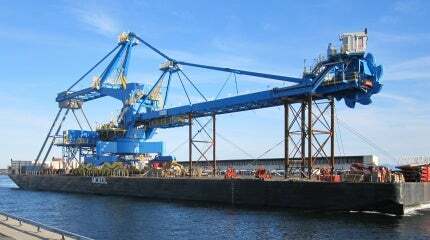 EMS-Tech mobile equipment and bulk material-handling engineer provided engineering, design and supply for all components of its client's multipurpose shiploader. EMS-Tech Inc specialises in structural, civil, mechanical and electrical engineering, with a team of professional engineers able to perform on-site and in-office visits. EMS-Tech understands that minimising operational downtime of bulk-handling equipment is critical to the movement of product and business success. EMS-Tech Inc supplies self-unloaders for industrial clients. The EMS-Tech Inc Land Based Equipment Design Group consists of engineers, technologists, technicians and support staff with vast experience. EMS-TECH Inc offers efficient, cost-effective repair and rebuild services. EMS-Tech is a mobile equipment and bulk material-handling engineering company, and was appointed to perform electrical works for Lafarge Canada. EMS-Tech was contracted to work with Martin Marietta Aggregates on the client's premier aggregate facility in Freeport, Bahamas. EMS-Tech was contracted to provide project works to Kinder Morgan Vancouver Wharves in Vancouver, Canada.